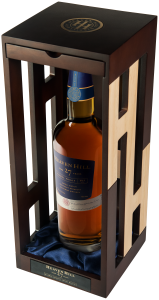 Heaven Hill Distillery announced today the release of Heaven Hill 27-Year-Old Barrel Proof Small Batch Kentucky Straight Bourbon Whiskey, a bottling produced at Old Heaven Hill Springs Distillery before it was destroyed by fire in 1996. Only 41 barrels produced in 1989 and 1990 were included in this limited release. Heaven Hill Barrel Proof Small Batch Bourbon, selected from limited remaining stocks of pre-fire barrels, has been monitored and allowed to age for 27 years. All but five of the barrels in this small batch were aged on the first and second floors, where increased humidity and evaporation caused the proof to drop. When all 41 barrels were mingled for bottling, the natural barrel proof was an unusually low 94.7 proof (47.35% abv).